Lignano Sabbiadoro, you're great fun! 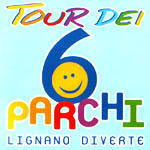 Lignano's Tour of 6 Parks. Get a real kick from your holidays, Strabilia's extraordinary, in Strabilia even grown-ups become kids again, in Strabilia you can get your fill of soft drinks and scrumptious sandwiches, in Strabilia fill up on adrenaline, Strabilia fun for the whole family. Only children pay at "I Gommosi" Park. The entrance ticket allows use of all activities. Adults may take children free of charge. You can relax and take advantage of the amenities provided in the park witch include benches and sun umbrellas. A large playground in the midst of Lignano Sabbiadoro set in the greenery with fontains and small lakes rich of local flora and fauna. The ideal place for games in total freedom and security. Qualified entertainers watch and follow the children at the games. Alternative games room with minibowling and other creative games. Bar, fast-food restaurant with special children menu. If required baby-sitting service. Parking for guests of the Park.